Welcome to the 3DF Zephyr tutorial series. In this recipe, you will learn how to generate an orthophoto with 3DF Zephyr. This tutorial requires 3DF Zephyr Pro (prior to 3.700) or 3DF Zephyr Aerial. This tutorial is not about reconstruction: if you are not interested in geographical analysis and survey you can probably skip this tutorial. An orthophoto, orthophotograph or orthoimage is an aerial photograph geometrically corrected (“orthorectified”) such that the scale is uniform: the photo has the same lack of distortion as a map. Unlike an uncorrected aerial photograph, an orthophotograph can be used to measure true distances, because it is an accurate representation of the Earth’s surface, having been adjusted for topographic relief, lens distortion, and camera tilt. 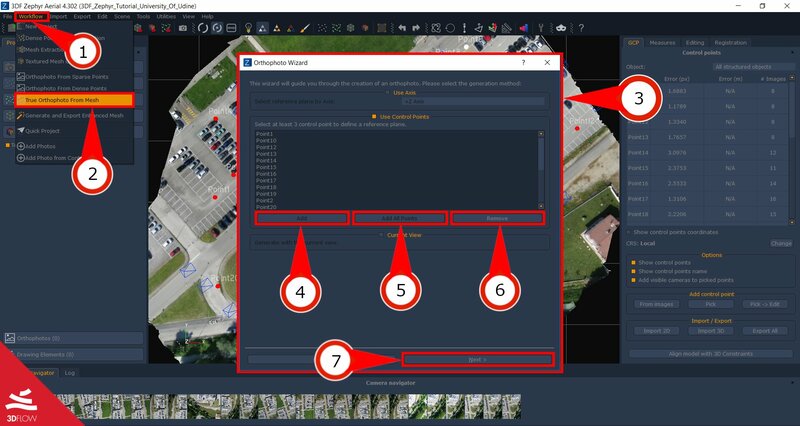 With 3DF Zephyr you can generate an orthophoto just in a few clicks: we will be using the same dataset used for control points. Please prepare your workspace and then proceed. Select “True Orthophoto from Mesh” (2). The “Orthophoto Wizard” window (4) will appear and will offer you a choice of orthophoto generation mode, by control points, by axis or by current view. Notice that this window is common for each of the three above choice. The Orthophoto Wizard will now present a whole new set of options while also rendering a preview in your scene. You can zoom, translate and rotate the camera with the camera controls (distance, rotation, X,Y ) and see the changes happen in real time in the Zephyr viewport. You can save a preview screenshot with the Take Screenshot button, or actually proceed to the orthophoto generation by clicking the “Generate Orthophoto” Button (12). To proceed with the orthophoto generation you must have generated a mesh first. After selecting the mode in the first window (3), the orthophoto generation wizard will appear. Subsection (8) will show the current coordinate system and allows you to select the mesh used for orthophoto generation. The “Position” subsection (9) will define the initial and final position of the orthophoto. You may set the limits via control points or by dragging a rectangle with the rubber band tool. 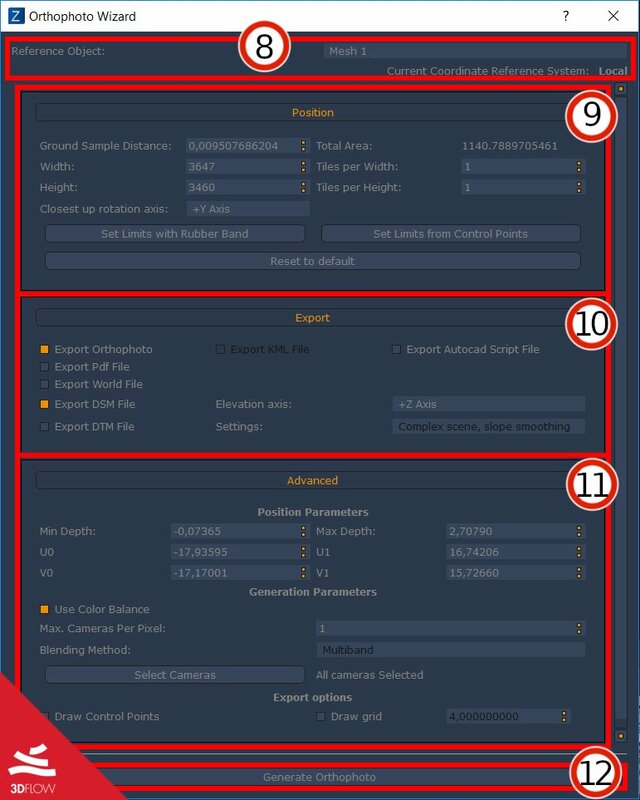 This section allows you defining the width and height of the output file (thus controlling the ground sample distance) too. blending – will weight the color source depending on the view angle and the distance. Although it’s robust to lighting changes, the mean won’t keep high frequencies. multiband – will use the mean to compute low frequencies and the best images to compute the high frequencies. This is usually a better choice than blending because while it is still robust to lighting changes (usually just a little worse than blending) by preserving high frequencies the resulting image will be more in focus and sharp. You may control the appearance of control points and control distances using the “show control points and distances in preview” checkbox. The orthophoto generation procedure is fairly linear, however, we advise you to experiment in particular with the generation method to verify which one best meets your needs depending on the incoming dataset. The next tutorial will show how to merge more file projects together. Click here to proceed to the next tutorial.